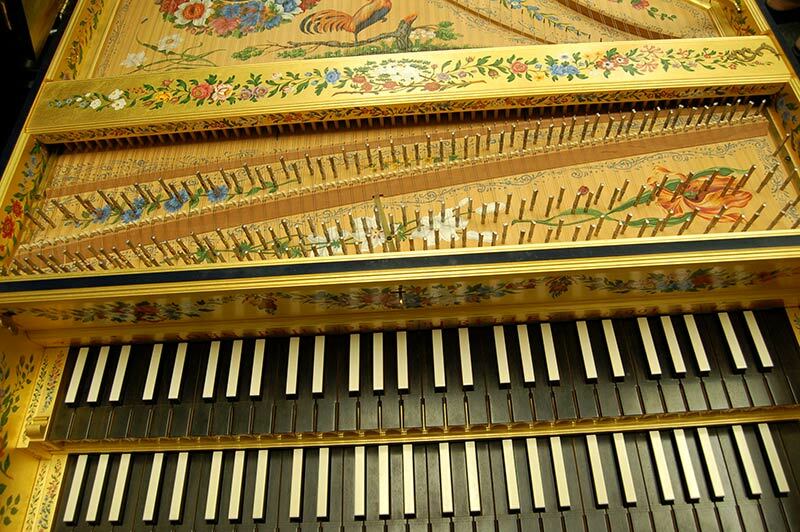 How the DHSBE Acquired our John Phillips Harpsichord . . .
Angelo Moreno had been in the process of locating a Harpsichord for 1.5 years even prior to the group’s initial existence. The instrument was found in San Jose, California USA at the St Joseph’s Cathedral just by chance. Mr. Moreno was in the church performing with my daughters Giavanna (violin) and Dchenin Moreno (cello) in a trio at a family wedding and he just so happened to spot three harpsichords covered up in the back of the room. After investigating with the Church Director, he found out that these instruments were donated and that the church wanted to sell them to raise funds for a concert series. Since the church director knew Mr. Moreno was a director of a public school orchestra program and that the instrument was going to be used to educate young musicians, she was very generous with her final offer. Mr. Moreno had Larry Snyder and Phebe Craig, both harpsichord experts in Davis, California and friends of the DHS Orchestra Program, assist him every step of the way. They advised him on all the instrument details as well as confirmed for him that he had found the best instrument and price possible on the open market. An alumni donor from the DHS Orchestra Program helped to offset the price of the instrument considerably. This donor contacted Mr. Moreno out of the blue one day four months prior to the group’s existence and shared with him that she was interested in donating a harpsichord to the DHS Orchestra Program in memory of her mother who just passed away. Her mother was a former music teacher and lover of harpsichord music and listened to harpsichord in her final days to comfort her. He shared with her the coincidence and perfect timing of her contacting him and that he was the only high school director in the country that would need a harpsichord since the DHS Baroque Ensemble was to be the fist one of its kind at the high school level in the country. The Instrument we obtained was built by John Phillips in 1991 in Berkeley. The instrument is called #44 which indicates the order in which he builds them. It was made originally made for Joseph Faria and was kept at Mission San Jose. The original owner, who has since passed away, was an attorney named Joeseph Faria. Joseph was collector of fine instruments and in the late ‘80’s purchased many fine instruments from local makers which eventually were donated to Mission San Jose. It is a Ruckers-Taskin model, based on the 1646 Andreas Ruckers, rebuilt by Pascal Taskin in 1780, which is in the Musée Instrumental at the Cité de la Musique in Paris. John Phillips has built around 35 of these models, and they have become his most popular model. UCD music department also has one, built in 1990. 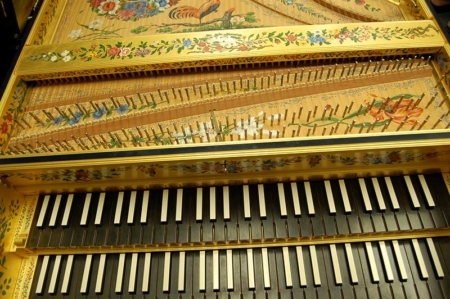 The DHS Harpsichord includes a fourth register in soft leather (peau de buffle) which is present on the original, but only rarely on the copies. All the decorations on the inside of the instrument and including the lid cover (which is a mural that depicts the Resurrection of Christ) was done by John Phillips’ longtime assistant artist, Janine Johnson. The instrument cost brand new has been estimated at over $49,000, final purchase price was $10,000, plus the private alumni donor paid $6,000 making the total cost to the DHS Orchestra Program only $4,000! In speaking with the maker, John Phillips confirmed that it is very rare for people who own this level of an instrument to resell them and even more impossible to get one at 90 % off its value. In the end it is an incredible story of many wonderfully knowledgeable and supportive people coming together and through their generosity helping to find the most perfect instrument for many generations of Baroque students to enjoy at DHS.